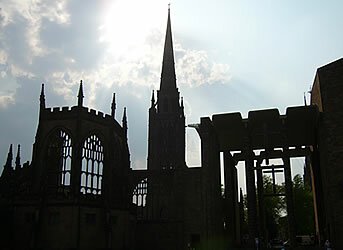 This page is a guide for visitors to the city of Coventry (population: 300,000). 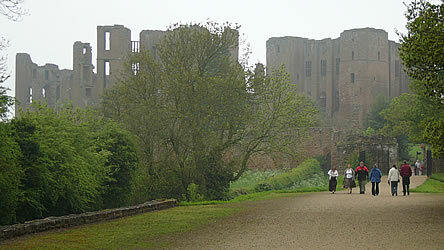 The city grew after an abbey was established here. It became wealthy from cloth production during the Middle Ages. 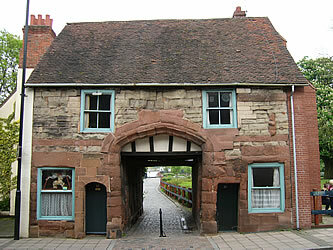 At one stage Coventry was the third biggest town in England. 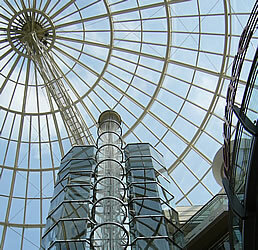 It fell into decline while Birmingham grew, but became a centre of engineering during the Industrial Revolution. The city was heavily bombed during World War Two. 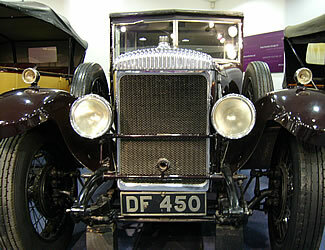 It was the centre of the British car industry, but suffered from the decline of manufacturing. Lady Godiva was the wife of Leofric the Third, the Earl of Mercia and Lord of Coventry. In the year 1057 Leofric imposed heavy taxes on Coventry and people were nearly starving. Lady Godiva was aware of the suffering that was being caused and kept begging her husband to lower the taxes. In an attempt to stop her from nagging him about this he promised to reduce the taxes if she rode naked through the streets of the town, believing that she would never do such a thing. However, he underestimated Lady Godiva's determination - she told the townspeople to stay at home that day and to close their doors and windows, and rode naked on a horse through the town on market day. Only one person didn't follow her instructions, a tailor called Thomas. He made a hole in the shutters which covered his window so that he could secretly watch the beautiful lady as she passed by. The sight of her body made Thomas go blind. When what he had done was discovered he became known as Peeping Tom. After Lady Godiva completed her ride Leofric kept his promise and removed the extra taxes which he had created. Ever since this time the people of Coventry have regarded Lady Godiva as their heroine, having saved them during their time of trouble. The story of Lady Godiva's ride through Coventry was passed down by word of mouth, and then appeared in written accounts, paintings and poems (the earliest known written version was by Roger of Wendover at the start of the 13th century, and the poem "Godiva" was written by the English poet Alfred Lord Tennyson in 1842; to see these click here). Lady Godiva existed - she died soon after William the Conqueror invaded England in 1066, and is mentioned in the Domesday Book. As with other legends such as Robin Hood, some of the details changed over time. Some people believe that she didn't ride without any clothes, but without her jewellery and fine things. Peeping Tom was not mentioned in the early accounts. 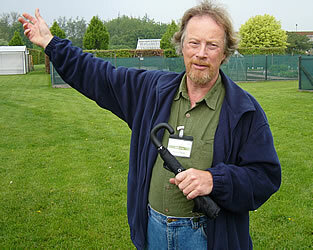 To this day voyeurs (people who watch others secretly) are still often referred to as "Peeping Toms". 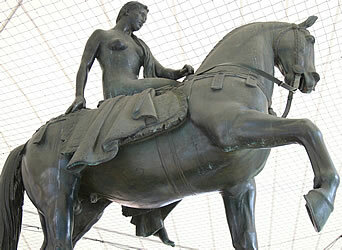 There are many references to Lady Godiva in Coventry. There are statues of Godiva and Leofric on the front of the Council House (the city hall). There is a Godiva statue outside the entrance to the Cathedral Lanes shopping centre. 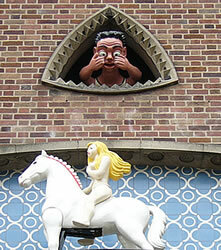 After the nearby Broadgate Clock strikes each hour you can see Lady Godiva ride past, secretly watched by Peeping Tom. There is a wooden statue representing Peeping Tom that has been placed in a window at the northern end of Hertford Street (the statue is actually of Saint George). Each summer there is a local tradition known as the Godiva Festival: a key part of this is a street procession which is led by a modern-day Godiva riding on horseback. 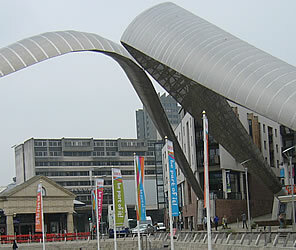 A comedy film called "Lady Godiva: Back in the Saddle" was filmed in Coventry and is due to be released in 2007 (see: http://www.imdb.com/title/tt0780552). At the time of the Second World War Coventry's factories were converted to produce military equipment. On the night of 14 November 1940 German bombers started a massive bombing raid which lasted about 11 hours. Many of the factories were destroyed, but also thousands of homes and most of the medieval centre (including the cathedral) were badly damaged. The ruins of the old cathedral have been preserved and serve as a reminder of the effects of war. 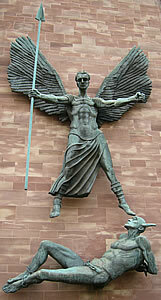 The new Coventry Cathedral (formally called the New Cathedral Church of St Michael, designed by the architect Basil Spence) was opened in 1962, next to the bombed ruins of the former cathedral (known now as Old St Michael's Cathedral). It has a very modern design and interior. "St Michael and the Devil"
When the ruins of the old cathedral were inspected after the bombings, two of the wooden beams which had fallen from the roof were found making the shape of a cross. 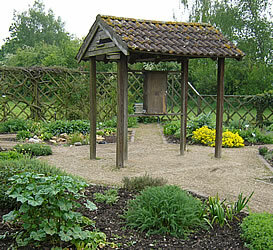 A replica of these beams has been created inside the ruins. Three medieval nails which were collected from the ruins were used to make a Cross of Nails (one nail is vertical, and the other two nails are placed horizontally in opposite directions), and this has been placed at the centre of the altar cross in the new cathedral. 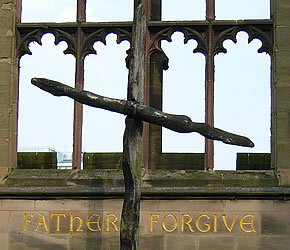 The key theme at Coventry Cathedral is of peace and reconciliation. Coventry has twinned itself with over 30 other towns and cities across the world, many of which have been chosen because they have also suffered from wartime destruction (including the German city of Dresden which was heavily bombed by the British). 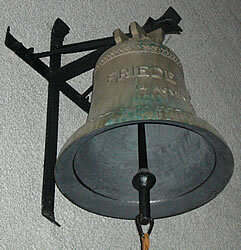 There was a special ceremony at the cathedral in 1990 (on the 50th anniversary of the bombing raid on Coventry) in which Richard von Weizsäcker, president of Germany, presented a peace bell as a gift from the German people: this bell can still be seen on the new cathedral's wall. 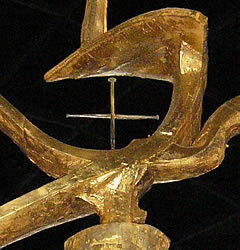 In return the Queen Mother gave him a cross of nails, which is now in the Museum of German Democracy in Berlin. 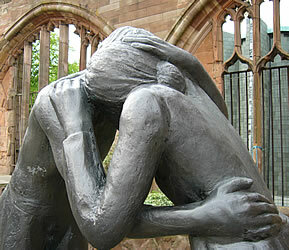 There is a Reconciliation Statue in the ruins showing a man and woman embracing: a copy of the same statue can be found in the Peace Park at Hiroshima in Japan. 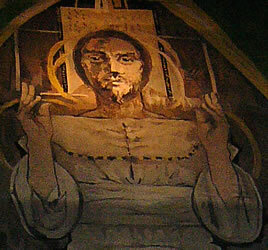 Behind the altar in the new cathedral there is a large tapestry by Graham Sutherland called "Christ in Glory". This shows an image of Christ dressed as a carpenter, surrounded by symbols representing the four Evangelists: Mathew, Mark, Luke and John. The tapestry "Christ in Glory"
James Starley was an Englishman who moved to Coventry as it became an established centre for engineering. 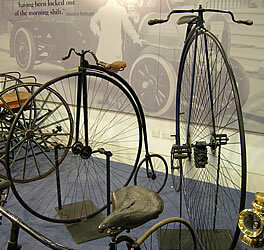 He invented a metal bicycle with a large front wheel called a penny farthing. The bicycle industry soon replaced clockmaking as the main industry here. 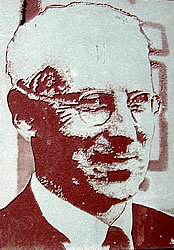 An owner of a bicycle factory bought the patent for a German engine and established the Daimler Motor Company, and other bicycle factories also converted themselves into successful car manufacturers. 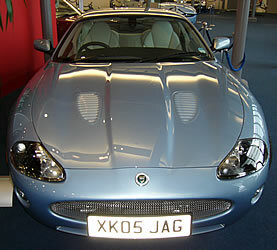 The most well-known car produced here was the Jaguar, a stylish brand of sports car. In recent years Jaguar has stopped production in Coventry, and Peugeot has announced large job cuts at its factory. 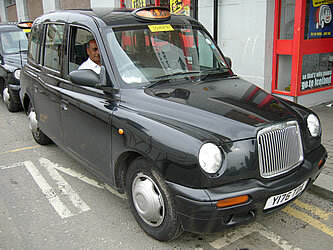 One car which continues to be made in Coventry is the famous black London taxi. 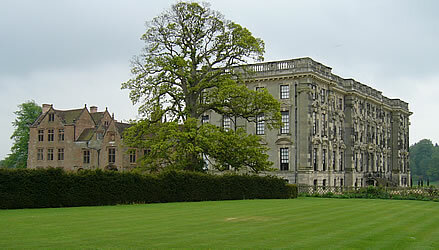 There are many students in Coventry. 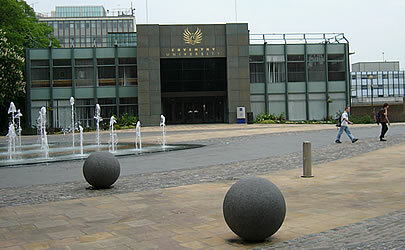 There are two universities: Coventry University is centrally located near the cathedral, while the campus of Warwick University is outside the city. 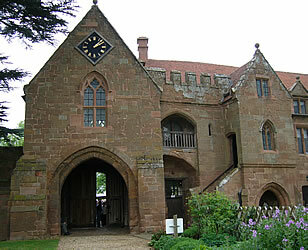 There is also a technical college (City College Coventry). Coventry had an earlier cathedral which was destroyed at the time of the dissolution of the monasteries during the reign of King Henry the Eighth. Some of the remains of the Cathedral of St Mary and Priory have been excavated, and there is a visitor centre explaining this. St Mary's Guildhall is a medieval guildhall which survived the bombing of World War Two. 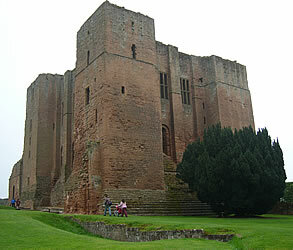 Henry the Sixth held his court here during the War of the Roses, and Mary Queen of Scots was held prisoner here for a time. 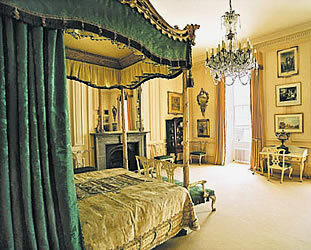 It contains a fine tapestry which is 500 years old. 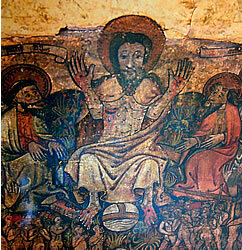 In Holy Trinity Church you can see the Coventry Doom: a rare 15th century wall painting of the Last Judgment, discovered by accident after a fire in 1986 burnt away the layer of whitewash that was covering it. 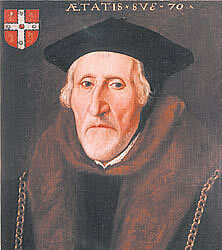 Paintings such as this were common in English churches before the Reformation. - By train it takes just over 1 hour to travel to Coventry from London's Euston station (about 20 minutes to Coventry from Birmingham New Street). For train timetables and to buy a ticket online, see: Shop/Company/TheTrainline. 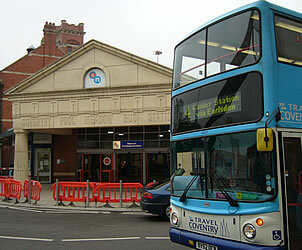 - By coach it takes about 2 hours to travel to Coventry from London's Victoria Coach Station. For timetables and to buy a ticket online, see: Shop/Company/NationalExpress.